One of Ellen DeGeneres' several bestselling books, Seriously...I'm Kidding makes for a light and quick but thoroughly positive read. 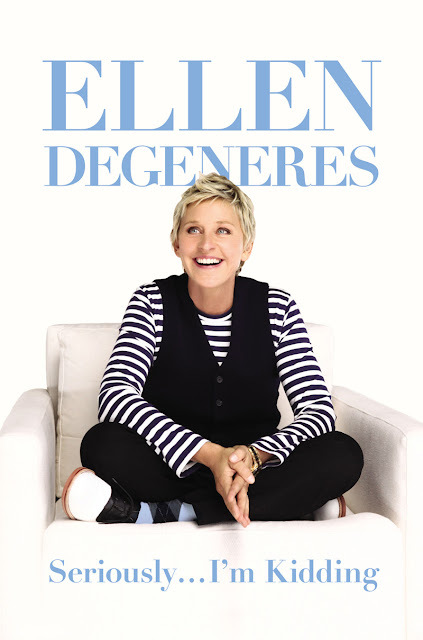 Ellen offers advice as she reflects on her life over the last few years (including her stint as a judge on American Idol), but like her popular TV show the book keeps things funny, fun, and entertaining. She rambles, at times you have no idea where she's going from one chapter to the next, but the book as a whole is encouraging and kind, much like Ellen herself. “Contribute to the world. Help people. Help one person." Have you read one of Ellen's books? I haven't read anything by Ellen but I do enjoy her showing once in awhile when I catch it on! This sounds like a really good, uplifting read with reminders that we all could use once in awhile. Great quotes you picked out too!